Panoramic view from San Marino City towards the Adriatic Sea. 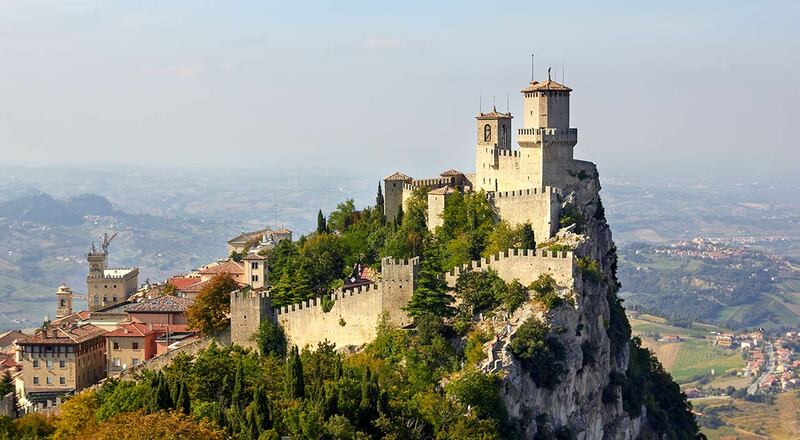 A virtual guide to San Marino, officially the Republic of San Marino, one of Europe’s five microstates located in Southern Europe, it is a landlocked enclave in north eastern Italy. The country covers an area of 61 km², making it the third smallest country in Europe, about one fifth the size of Malta, or about one-third the size of Washington, DC. San Marino consists of one small city and smaller settlements clustered around Mount Titano, one of the peaks of the Apennine mountain range. 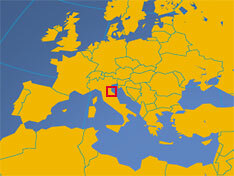 The republic has a population of 33,100 (in 2016), capital is the city of San Marino. Spoken language is Italian. According to tradition, it was founded by a Christian stonemason named Marino in 301 A.D. San Marino's foreign policy is aligned with that of Italy. Social and political trends in the republic also track closely with those of its larger neighbor. 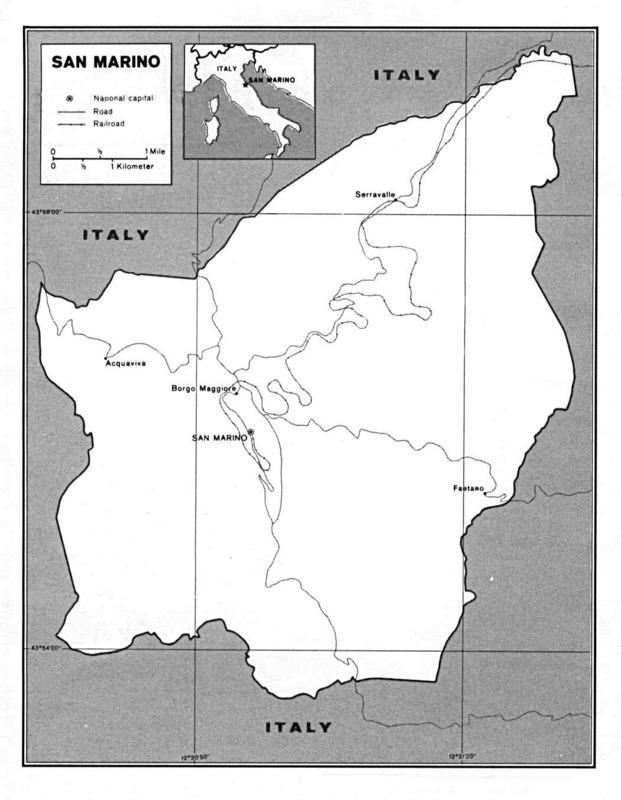 Other Cities: Serravalle (largest city), Borgo Maggiore, Domagnano. Location: Southern Europe, an enclave in north-east Italy. Agriculture products: Wheat, grapes, corn, olives; cattle, pigs, horses, beef, cheese, hides. Industries: Tourism, banking, textiles, electronics, ceramics, cement, wine. Exports - commodities: building stone, lime, wood, chestnuts, wheat, wine, baked goods, hides, ceramic. Imports - commodities: wide variety of consumer manufactures, food, energy. SM is a parliamentary representative democratic republic. The the two heads of state of San Marino are the Captains Regent, they are elected every six months by the Grand and General Council. Secretary of State for Foreign and Political Affairs. Address list of San Marino's diplomatic missions abroad. Address list of foreign diplomatic missions in San Marino. Searchable map and satellite view of San Marino. The fortress of Città di San Marino on Monte Titano. 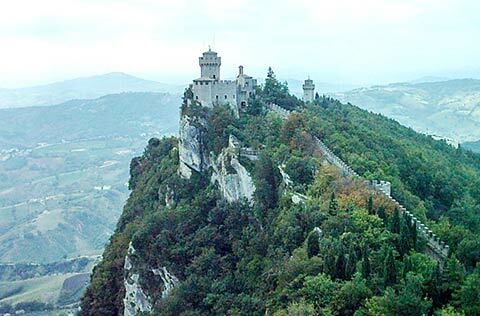 San Marino Historic Center and Monte Titano are a UNESCO World Heritage Site. San Marino news (in Italian). News from San Marino and Romagna region (in Italian). More news from San Marino (in Italian). State Museum of San Marino presents archaeological finds, art objects, and much more related to San Marino's history. Allegro Vivo promotes musical culture and artistic activities in general in San Marino and abroad. Central Bank of San Marino. Discover San Marino: Monte Titano, Three Towers of San Marino: Guaita, Cesta, and Montale; Museo di Stato, Palazzo Sums, Chiesa di San Francesco church, San Marino Adventures amusement park, Museo Creature della Notte vampire museum. Find accommodation, hotels, attractions, festivals, and much more. Official tourism website of San Marino. A San Marino portal web site, with news, events and more tourism information (in Italian). The Secretariat of State for land, the environment and international economic cooperation (in Italian). Government page about San Marino's environment. Government page about San Marino's history.